The Wikidata Game has been a success, both in terms of work done, as well as a demonstration of micro-contributions to Wikidata. I consider ~2,500 players not a trivial thing, considering the games are neither particularly thrilling, nor resulting in awards (how about one repercussion-free vandalism on English Wikipedia for 1,000 actions in a sub-game?). However, I found the underlying system increasingly complex to work with, and did not add any more games recently. This is despite several people suggesting games, and even providing data to play on. 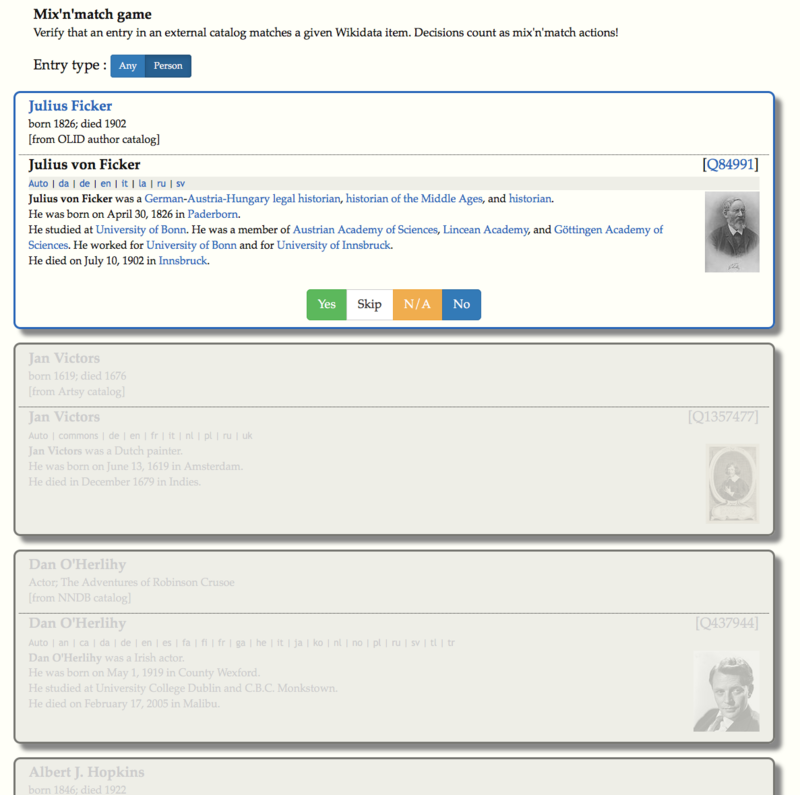 So, just in time for Wikidata’s third birthday, I present The Distributed Game. What’s new, you might ask? Just about everything! First and foremost, the concept of “game”: The site does not hold any actual games. Rather, it holds a list of “game tile providers”, that is, other web tools (APIs) that generate game tiles to play. The great thing about this is, anyone with a little programming experience can write a new game, test it on the Distributed Game, and add it as a new game, all with a few clicks! So if you are a programmer and interested to have people play with your Wikidata-related data, check out the API doc. The “merge game” from the original Game. Thanks to the API model, it runs on the same data set, and even credits your edits there as well! A “mix’n’match game”. In my mix’n’match tool, you can match external catalog IDs to Wikidata items. One way to do that is to confirm (or remove) automated, name-based matches. These are now exposed as a game. As above, confirming or removing a match in the game will also credit you in mix’n’match (and on Wikidata, of course!). A “match new articles” game. Again, this runs on existing data, in this case a list of Wikipedia articles with no Wikidata item in the duplicity tool. 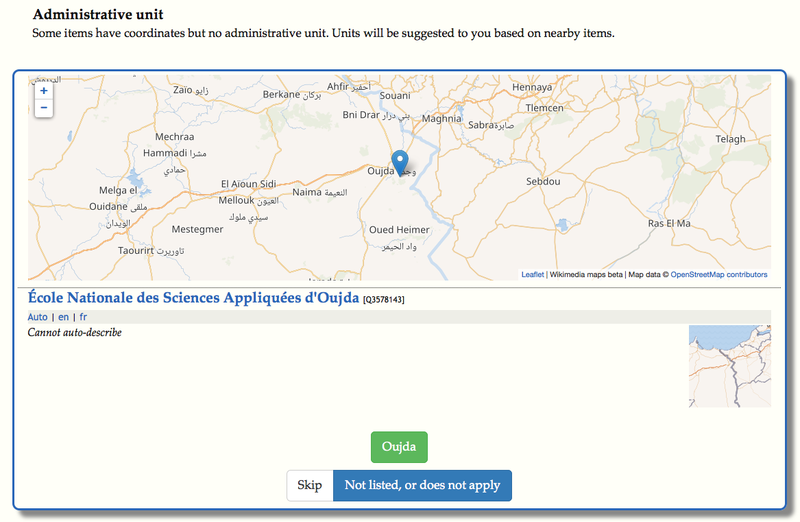 A brand-new game, with a bespoke data set, that tries to infer the “administrative unit” for a Wikidata item from its coordinates, and other items nearby. That last game shows a strength of the new gaming system: The “game tile” (essentially, the information required to complete the task) can consist of several types of display; in this case, a map (using the new Wikimedia maps service) to get a look at the region, the Wikidata item (as an automated description, with inline previews of associated Wikipedia pages), and buttons to decide on the task. Other types include a Wikipedia page intro, or “just” static text; adding more types is quite simple. 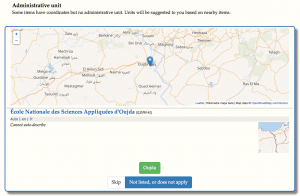 Store your decision centrally, for Recent Changes, user contributions, statistics etc. Feed your decision back to the remote API that provided the game tile, if only to mark this tile as “done” and not present it again. Perform one or more edits on Wikidata. Quite a few new ideas have gone into the interface. Wikidata item previews show image (if available) and map (based on coordinates) thumbnails. The next “game tiles” already show, but are greyed out. Page URLs update automatically to provide a link to the current “game state”. Games can offer different modes (for example, the “merge game” offers to only serve entries of people). You can set a list of languages, which will be passed to the individual games (it is up to the game to act on that appropriately). At the moment of writing, there are several functions that the Distributed Game lacks, in comparison to the old one, including text highlighting, and detailed statistics. I have not yet decided which other games, if any, to port from the “old” game. I think for this “game 2.0”, it is more important to get the essentials right, and to make it visually appealing (I have borrowed some ideas from tufte.css), rather than to be “feature-complete”. The original Game will continue to work for the time being. So, if you have a sub-game you really would like to see ported to the new system, or know of a data source that would make for an interesting game, please contact me. More importantly, though: If you are a programmer, check out the documentation, and have a go at writing your own. After all, building a whole from individual, diverse contributions is what makes us mighty. This was written by Magnus. Posted on Tuesday, October 13, 2015, at 17:46. Filed under Wikidata, Wikimedia. Bookmark the permalink. Follow comments here with the RSS feed. Both comments and trackbacks are currently closed.